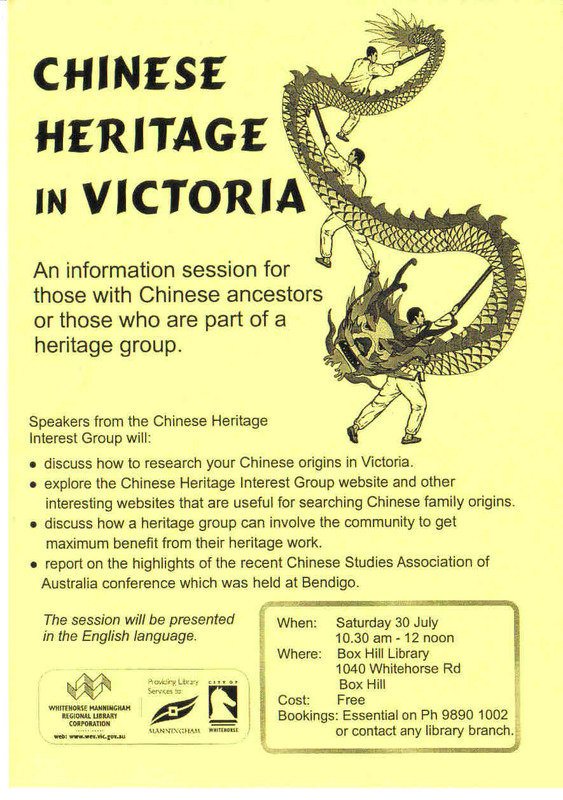 The Chinese Heritage Interest Network is a not-for-profit private research group with an interest in the Chinese heritage of regional Victoria. Our first focus project was researching and documenting the life and times of the Chinese community of Creswick, Victoria, Australia (circa 1850 to 1901). However, as might be expected, our research soon takes us beyond the border of Victoria, and even overseas, such as the USA and of course China. Working with the local community our progress is remarkable and results rewarding. Advising the Museum community on "things of Chinese Heritage"
In 2005, our Organisation was invited by Professor John Fitzgerald, President CSAA, to be on the CSAA Conference Committee responsible for organising The Chinese Studies Association of Australia, 9th Biennial Conference in association with the International Society for Study of Chinese Overseas (ISSCO). We continue our work in the development of historical indexes, documenting discoveries, tracking local identities and capturing oral histories associated with the life and times of the Chinese gold miners, market gardeners, farmers, carpenters and the likes. Hence, we are interested in talking to folks who may help add to our collection of what is turning out to be a rich tapestry of Chinese heritage in Australia. CHIN was founded by Carol Scott, Doug Scott, Mun Chin and Ivy Chin. The Founders Directors are residents of Victoria, Australia. The Victoria Gold Fields were often referred to by the Chinese during the Gold Rush days as "The New Gold Mountain" -- the "old" Golden Mountain being California, USA. The Directors and their associates have special skills and experience in photographic, multi-media, complex historical searches, Chinese language, in particular Cantonese, Hoisan, Hokien and of course Mandarin. In addition, the Directors have direct connections with Chinese Heritage Organisations in China, USA and other countries in Asia. A member of the Director has convict stock, while another Director is of the 27th Generation of a Chinese pioneer who himself is a descendent of a Royal Potter from the Hebei Province, People's Republic of China.